Last week we featured a video of Shalom Sesame muppets searching for the afikoman while singing Matzah in the House, a parody of Les Miserables' Master of the House. Today we return to Shalom Sesame for another Passover video. This time, it's the story of Khalikidan's Pesach. 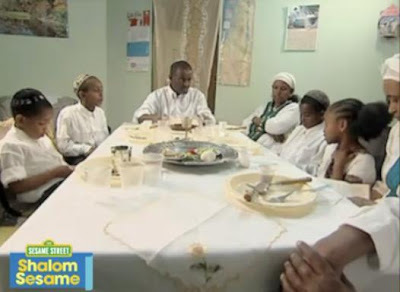 Khalikidan and her family came to Israel from Ethiopia and live in the seaside city of Netanya. We join her family in baking their own matzah, searching the house for chametz, and share Khalikidan's excitement in reciting the four questions and searching for the afikoman. The Ethiopian Jewish community, known as “Beta Israel” is an ancient community which was cut off from the rest of the Jewish Diaspora centuries ago. There are differing theories as to the community’s origins and when they went to Ethiopia. The large Aliyah from Ethiopia began after rulings were issued by the Chief Rabbis of Israel at that time, Rabbi Ovadia Yossef in 1973 and Rabbi Shlomo Goren in 1975, declaring Beta Israel members to be Jews. Between 1977 and 1984 a total of some 7,000 Jews came to Israel on foot, via IDF naval ships and by plane in numerous small operations. Due to the imminent danger that threatened the Jews remaining in hostile Ethiopia, a covert aerial evacuation operation was planned. The operation, called “Operation Moses” brought 6,700 Ethiopian Jews to Israel between November 1984 and January 1985. However, the operation was prematurely publicized by the media, causing it to be halted before all the Jews were evacuated. This resulted in families being separated, with some members in Israel and others returning to their villages in Ethiopia. A number of months later, in 1985, within the framework of a small covert operation called “Operation Sheba” an additional 650 people were flown to Israel. Following a long interruption, a large wave of immigrants left in 1991 in yet another operation, called “Operation Solomon”. This complex, well planned operation airlifted some 14,400 people from Addis Ababa to Israel in a single day. The Aliyah of Ethiopian Jewry represents one of the most fascinating and wonderful stories of the Jewish people and of Zionism. It expresses the fulfillment of an ancient dream as well as the longing for and lasting bond with the land and people of Israel. MAKES MY HEART SWELL WITH PRIDE AND DELIGHT !! !